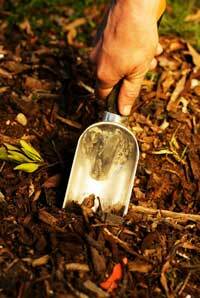 Mulch – it’s one of best things you can do for your garden. You simply use it to cover the bare soil between plants in your planting beds. You’ve probably noticed that nature doesn’t like bare soil. Bare patches soon have something growing on them, usually weeds. That’s nature’s quick and dirty way of ensuring that soil doesn’t wash away or blow away. But if you’re a gardener, you aren’t exactly in love with weeds, so you should try mulching. This is one garden job that makes other garden chores easier. As well as making your beds look neater, it does a lot of other great things. It’s hard to think of another job that gives so much garden payback. It keeps weeds down, mainly by blocking out light they need to germinate – and if a weed manages to poke through, it’s easier to pull it out when rooted in a layer of mulch than in the soil. Conserves soil moisture by reducing evaporation, and helps prevent erosion caused by rain and wind. Bare soil often gets a crust on it that prevents rain from penetrating easily. Moderates soil temperatures. Keeps soil cooler in summer and helps to reduce the risk of damage to plant roots in winter. Keeps soil from splashing onto leaves, which keeps plants looking neater and helps prevent soil-borne fungal diseases. Organic material adds all-important humus to the soil as it decomposes, and keeps the top layer of soil loose and airy. Depth: All you do is just layer the stuff two inches to four inches deep over bare soil around your plants. Just don’t put it right on top of perennials, and keep it from direct contact with the bark of trees and shrubs, as excess moisture right up against the bark can cause disease and rot. 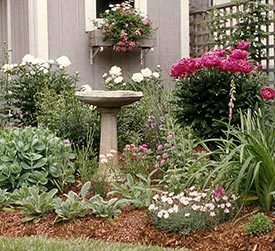 When to apply: Do the job in spring before hot weather comes and while annual and perennial plants are still small enough to work around easily. How to protect plants: If you happen to have a few spare one- or two-gallon nursery containers, put them over top of your plants and then you can shovel the material right onto your bed without worrying about covering your perennials. As for what to use, see choices below. Winter mulch: This doesn’t actually keep plants warm, but maintains a more even soil temperature – a good thing in areas where winter brings alternate periods of freezing and thawing and where there isn’t enough snow cover to give plants a thick insulating blanket. Boughs cut from your Christmas tree also make good winter covering, and have the added bonus of trapping insulating snow that might otherwise blow away. Perhaps the strangest soil covering I ever saw was a wine corks spread all over a flowerbed. It worked just fine – cork is a natural biodegradable material eventually. But I’m sure the gardeners’ neighbors speculated about their drinking habits. Bark or shredded wood chips: Available shredded or in small or large chips. Excellent under trees and shrubs. Finely shredded cedar bark works for flower beds. Cocoa bean hulls: Good for flower beds. Garden smells like chocolate at first, but scent fades quickly. Can get moldy if laid it on too thick – don’t add more than two inches. Very light and can blow away – watering after spreading helps. Avoid using if you have a dog who might chew or eat it, as chocolate can make dogs quite sick. Compost: Plants love compost, but unless you can buy it or have a huge compost pile, it’s hard to have enough on hand. When I use compost this way, I use only about an inch or so, and top it with another material such as leaves or straw because compost can be a fertile launching pad for weed seeds. Grass clippings: Have high moisture and nitrogen content when fresh and can get smelly, so apply thin layer. Don’t use when grass is going to seed, or it could germinate in your beds. Fall leaves: Masses of them are free in fall. Best used chopped – otherwise they can mat and stop air and water movement into the soil. To chop, use leaf shredder, drive lawn mower over them or put them in a sturdy plastic garbage container and chop with weed eater. Use as a winter covering, or save in bags or a pile for spring. Straw: Keep bales from autumn decorations as straw makes great mulch for vegetable gardens. Also excellent winter protection. Pine needles: Long lasting, light and easy to get in fall if you have pine trees. Leave in place in top of soil under your trees or rake up to use elsewhere in the garden. Cones from pines and other evergreens can also be used. Ideal for woodland gardens.